From the age of five until I was 18 I was a gymnast. I competed until the age of 13 and then began cheerleading and gymnastics through Jr. High and High School. I loved the competitiveness and performance of each of these things. They gave me purpose and kept me busy outside of school. At 18 I graduated high school and of course was finished with my extra curricular activities. About a year after graduating high school I started to have severe lower back pain…to the point of not being able to stand up right after getting out of bed. I saw a doctor about a year after the pain started and after a couple of tests the verdict was “a slipped disc.” Physical therapy was ordered. “If you can strengthen your core it will help it heal in time,” they said. I left every appointment in more pain than ever before. Chiropractic work was ordered. Adjustments…stem…traction…more adjustments…all good and well, but only temporary. The pain would return, full force, within a couple of days. For eight years I was in and out of physical therapy and chiropractic offices. Finally, after having my son and having the most excruciating last three months of pregnancy, we said enough is enough. I saw a neurosurgeon this time and after more tests he found that I had spondylolisthesis (which is the forward displacement of a vertebra, especially the fifth lumbar vertebra, most commonly occurring after a break or fracture.) Sure enough I had a break in my vertebra, which doctors think happened very early in my gymnastics career, and I was to undergo surgery as soon as possible. At the age of 28 I had a spinal fusion and my life was forever changed! (For the better!) 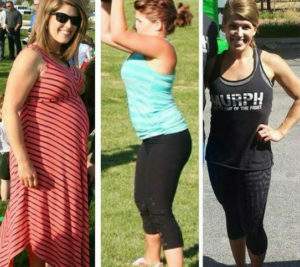 I was pain free within about six months and pregnant with our second child 10 months post surgery! And then Coach Ben and Coach Catie moved to town. CrossFit Fireside was in the beginning stages and they were holding park WODs every Saturday at a park within walking distance of our house. My husband, Matt, started going and was very positive about the workouts and instantly “addicted”. I had to know what it was all about! After getting approved to work out again at my six week check up, I found myself at my first workout. It was so hard, but I loved it! The workout wasn’t easy, so to finish something that I thought was impossible was indescribable. Truly. That might sound a little bit silly, but being able to start AND finish a workout at this level 6-8 weeks post baby let alone spine surgery, well it made me feel incredible. I too was addicted. I went from the park, to their home/garage gym, and finally to the amazing grand opening of the official CrossFit Fireside Gym. Coach Ben and Coach Catie believed in me from before I even started. They encouraged me to push and challenge myself while standing right beside me and knowing my limits. Without them I would not be where I am today. Nine months since my first ever WOD and five months since being in an “official gym” I am down two pant sizes, I am twelve pounds lighter than my starting weight before baby #2, my back and core are stronger than EVER before (even at the peak of my gymnastics career), I am motivated every day to do my very best, I actually can’t wait to go to the gym, I have established lifelong friendships, I have succeeded, I have failed, I have tried again and not given up, but most importantly my kids come with me to EVERY workout and watch mom set an example of leading a healthy and active lifestyle. I am so thankful CF Fireside is a family friendly establishment that welcomes us with open arms, challenging days and all! As moms it is hard enough just getting to the gym but then making sure the kids are happy and controlled during a WOD is another story. Having CrossFit as a part of my life has changed me in so many positive ways and has made my life so much better. Thank you Ben and Catie for making me a better and stronger me and for showing me a workout that leaves me breathless (literally) but totally wanting more!